These are the tightest wrapped and best shock absorbing furled leaders that you can cast with on the end of your fly line! The Bug Turner leaders are for larger line weights or bigger flies and has a barrel swivel to attach large tippets to for dah’ lunkers! For silk lines #2 to #6. Floats after treatment with Red Muclin. 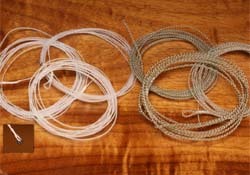 Braided material in a natural color. Size: Approx 170cm; 0.27mm diameter. or for very fine synthetics #4-#6. Finish: Furled material in a green or natural color. Size: Approx 160cm, nylon point 0.25mm. Note: do not remove loops as the leader will unfurl. or for very fine synthetics #1-#3. Size: Approx 160cm, nylon point 0.20mm.